Rasagola has a historical and cultural link with Odisha, a state of eastern India. Read about 'Rasa', Rasakora, Rasabara, Rasagola in Odia Dictionary here. 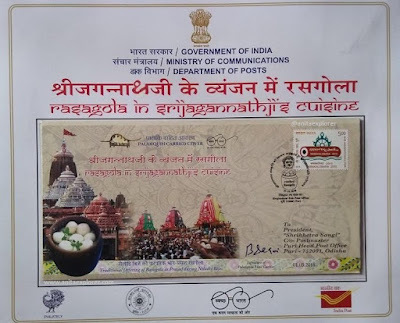 Rasagola is a centuries-old Mahaprasad of Puri Jagannath Temple that is offered to Lord Jagannath and His wife, Mahalakshmi, every year on Niladri Bije, the last day of Ratha Jatra (Car Festival). However, most of the world is still unaware about the real origin of Rasagola. Following the Banglar Rasogolla GI tag in November last year, there has been blatant misinformation. Even pink papers like the Economic Times and sites like the Conde Nast Traveller have presented distorted and misleading reports. 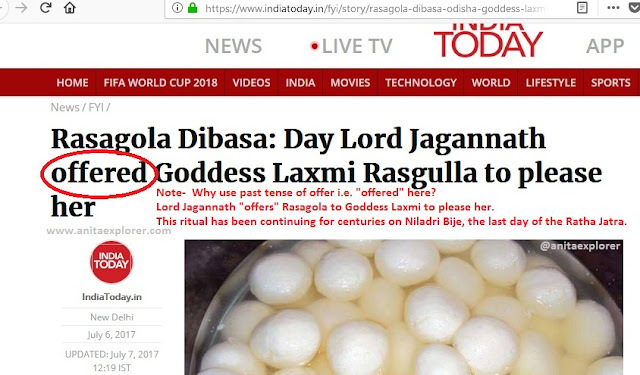 Why is it that no national media reports news about Rasagola in Shree Jagannathji's cuisine? Why all the national papers did not find this interesting for publication- that this special cover has been released by the Department of Posts? 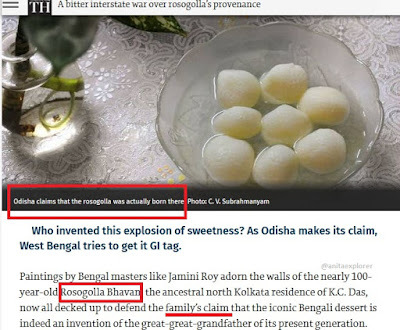 Why is it reported that "Odisha claims" ownership of the Rasagola like in this article published in the Hindu? What is the proof of Nabin Das and K.C.Das family that they "invented" the Rasagola ? Just a stone plaque that has been set up in 1968 "claiming" that it is 100 years of "invention of the Rasagola"! Why are the claims of Bengal so easily accepted but the centuries-old traditions of Odisha are not accepted? 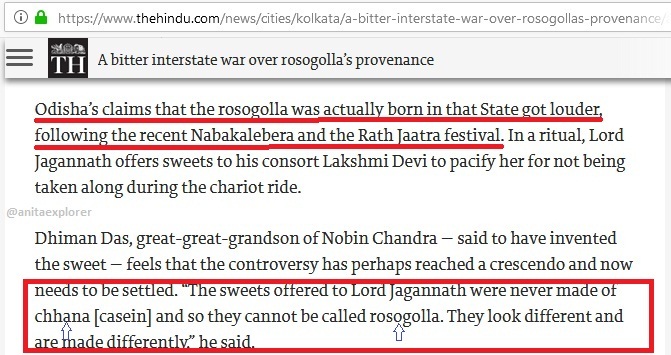 Why is the spelling of our "Rasagola" and "#RasagolaDibasa" changed as per whims and fancies of the people and media? Presently, different newspapers and media-houses use different spellings of Rasagola. There is no common spelling though ‘Rasgulla’ and ‘Rosogolla’ are comparatively used more despite the "Banglar Rasogolla" GI tag that has used "Rasogolla" as the spelling! Most people have no clue about the spelling and use many variations viz. Rossogolla, Rosogulla, Rosogullah, Roshogolla, Rossogulla, Roshogullah, Rasogolla, Rassogolla, Rasgolla, Rasogulla, Rasogula, Rosogola, Rossogola, Rosogula, Rosogulha, Roshogulah, Rasgoola, Rusgola, Rasgula… and the like. Have you wondered which spelling to use? Such variations cause confusion. The public is never sure about the correct spelling of ‘Rasagola’. The food-guides and dictionaries are not helping to make an informed decision in this regard. Many articles, books and online resources like videos have wrong spelling and information. ‘Name’ and ‘Spelling’ is a way to exercise claim/ownership, discussion, and news. No matter how it's spelled/pronounced #Rasagola #Rasogolla #Rosogolla #Rosogulla #Rasgulla has been associated with Odisha & Puri Jagannath Temple for centuries. Media news headlines+reports are misleading. The purpose of #RasagolaDibasa is to share the story and glory of Odisha Rasagolas. Why use alternate spellings for RASAGOLA or DIBASA and why change the hashtag? 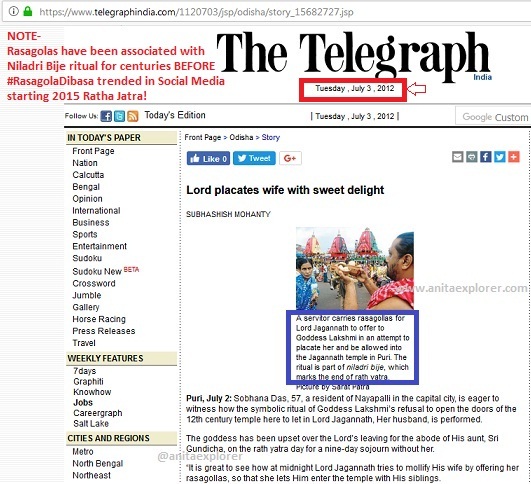 When I tried to check the article 'Lord Jagannath placates angry Mahalakshmi, reenters temple' in the given Pioneer newspaper link, I found the link does not exist any more. Why the need to provide wrong link and to suppress information? Some articles, like the one below, still exist that clearly mention the ancient Niladri Bije ritual where the bhog is Rasagola. Notice the year of publication is 2012 i.e. 3 years before the first #RasagolaDibasa was celebrated on Social Media and before the so-called "war" between Bengal and Odisha! Do accept and use the correct spelling and hashtag this year. This is open for all. Come on, share your sweet Rasagola posts this #RasagolaDibasa! To settle the dispute once and for all, the apex court should be approached, as it involves two states, with all historical evidence. Gola seems right as it means round- bhu gola and not gulla or golla. That apart rasagola remains a lip smacking favourite sweet by whatever name it is called! Whatever the controversies are, whatever the misconceptions are there(actually i dont have much knowledge about the origin,so better remain silent) Rasagolla(as said in Bengal) was/is/will always be my favorite. I must admit that you have raised logical questions and issues here..
Nice to know the history. Informative and genuine post 👍 Anita. Nice informative post, dispelling many of the misconeptions associated with the sweet. Jai Jagannath.